Today made me think of a couple of Westerns. In one of my favourites, Tombstone, a member of Curly Bill’s gang has been killed. Even though this gang of Cowboys has terrorised the town for years, the gang arranges a grand funeral and marches the coffin through the streets expecting everyone to pay their respects. In the other, The Magnificent Seven, the bandit tyrant who has impoverished the villages for years justifies leaving them to starve by explaining how onerous are the responsibilities of leadership. He is so wrapped up in his own myth that he expects the people he is robbing to feel sorry for the ‘weight’ he has to carry. In similar fashion, the Tories have paraded the pomp of Margaret Thatcher’s ‘state in all but name’ funeral in front of us all, with no regard or sensitivity for the misery inflicted on ordinary people by Thatcher’s policies when she was Prime Minister – or for the miseries that are being re-intensified by the current government and inflicted on vast numbers. Just like Eli Wallach’s bandit character in The Magnificent Seven, Tories have shown no embarrassment as they have shamelessly distorted the truth and rewritten history to eulogise Mrs Thatcher. If they were to be believed, she all but saved the world and turned Britain from a 3rd-world country into a paragon of prosperity. The divisiveness of her policies, and the misery they inflicted, are brushed aside as ‘tough decisions that had to be made’. One former Tory minister, who claimed to have been elected by a mining community, even went so far as to blame the victims. After all, his community in the Midlands had ‘picked itself up and got on with it’ after their pits were closed – so those in South Yorkshire, Derbyshire, the North, Scotland and Wales just didn’t try hard enough to get back on their feet. They only have themselves to blame, apparently. Poor old Eli Maggie. Rotten, lazy old villagers miners and their families. Don’t they realise the burden of power and responsibility? How dare they bemoan their miserable little wounds when Maggie was only doing it all because she had to. The crassness of it all was no less staggering for the plummy voices of those justifying it. A million miles away from the vile pomp and circumstance, a very different set of events was taking place. A very different ‘Maggie’ was at the Job Centre facing the consequences of the policies initiated by Margaret Thatcher and continued by her ideological children. Her name isn’t really ‘Maggie’. I’ve changed it to protect her identity. But as she represents the end of the supposed rainbow that Thatcher’s ‘light’ created, it’s as good a pseudonym as any. The living ‘Maggie’ is 29 and barely literate. Her only experience of work is a temporary Christmas job in a shop, and she has a couple of young children. She lives on one of the town’s poorer estates, where the unemployment rate is extremely high even for part of a town which has one of the highest rate of unemployment in the country. Maggie would struggle to read good English. I’m a writer, yet even I struggled to parse that passage, which has various random capitalisations, lacks commas where they are needed and misses the occasional word – and which runs one clause into another without punctuation. To make things worse still, the letter refers to a ‘my skills questionnaire’, when in fact the questionnaire is called a ‘my strengths’ questionnaire – more than enough to terrify someone with poor reading skills and low self-confidence that they might be completing the wrong documents and suffer a benefit ‘sanction’. All in the space of the couple of days from the arrival of the letter to today. I’m highly literate, and I like to think I’m no stranger to organisation and effort – but I would have struggled to complete all that in the time available. Especially with a couple of young kids. ‘Identify a list of employers…business directories..or the internet may be useful’. ‘This will allow you to build up rapport with an employer’. ‘Ethos’, ‘rapport’ – and a detailed, intensive series of actions, to be completed for 15 companies in a couple of days. By someone who can barely read or write. And if you can’t do it – we’ll sanction your benefits. When applying for jobs it is important to emphasise your strengths and abilities..This exercise has been scientifically shown to find people’s strengths.. The website will ask you to complete 48 questions. This should only take you 10 minutes. 48 questions?! A woman who can barely read is told to enter a website address, answer 48 questions in less than 10 minutes – one of the early ones is “When the topic called for it, I can be a highly rational thinker”! – and all in addition to the ’15 prospective jobs’, working out how to apply for jobs on 3 job websites and visiting 3 employment agencies to register and apply for at least one job at each. Edit: an even ‘better’ question was ‘In the last month, I have been thrilled by excellence in music, art, drama, film, sport, science or mathematics’. What are these people on?! aim to use each of your strengths in a new way everyday (sic) for at least a week. Leaving aside the impossibility of using strengths in a new way for at least a week in a period of a couple of days, what staggers me about all this is the absolute lack of even the remotest commonsense appreciation of the reality and limitations faced by a lot of long-term unemployed people. Whoever wrote this letter and the forms that came with it clearly had not the faintest idea of the lack of skills and confidence of a lot of unemployed people from poor backgrounds, nor of how to communicate in a way they might understand. ‘Maggie’ was absolutely thrown into a panic by this letter when she received it. Life is hard enough with state support, and the fear that her benefits would be stopped if she couldn’t complete this impossible set of tasks in a couple of days. Fortunately, she went round to see some friends of mine who live near her, and they were able to help her get at least the basics done, even if the exercise and its results were meaningless. She has more chance of winning the lottery than of finding a job via that process, even if she manages to complete it with help. The process, the way the letters were written and the ridiculous expectations betrayed a staggering callousness, lack of empathy and a complete ignorance of the daily reality faced by millions of people; people that this country has failed, abandoned – and then blamed for their plight, just like the idiot former minister blamed mining communities for not making enough effort. That social psychopathy, and the swaggering arrogance of those who ordain it, is Margaret Thatcher’s real legacy – that and the misery of millions that it ignores. And on the day she was buried, the way our living ‘Maggie’ was treated showed what a travesty the decision to award her a state funeral in all but name really is. Sigh. It’s hard to define common sense but it’s pretty obvious when it’s not there – and I don’t pay my taxes for this sort of silly bureaucracy. Unfortunately, it’s far more serious than just silly bureaucracy (although it’s certainly that too). Even without literacy difficulties, a great many people receiving this or a similar letter will be thrown into a panic. As with the Atos questionnaires, even reading the questions can induce panic/stress and the underlying threat of ‘loss of benefits’ is the hard to rationalise part. This isn’t a one-off, it’s part of a growing pattern of treating ‘claimants’ in ways which, if not deliberately designed to ‘trip them up’ (it’s looking very like it) are certainly thoughtless enough to have that result in many cases – and they are ongoing/continuous and subject to changing (upwards – in terms of increased ‘requirements’). At some point, even someone who has been ‘fulfilling requirements’ is going to miss something/not be thought to have done ‘all that is considered reasonable’ and receive a ‘sanction’ (loss of benefit monies). Your point about the wording is an important one – firstly because it is so badly written (and this is typical) as to be semi-incomprehensible – again, this may not be deliberate but is very often the ‘house style’. Secondly, because it’s overly jargon-heavy and could be virtually meaningless to some people – at the very least unclear – and yet carries the “If you don’t do what we are asking you will not be given anything to live on” threat. Letters like these/of a similar type go out to people living within a wide variety of circumstances (possibly with learning/literacy difficulties, mental health conditions, parents and other groups who may are very often depending on the money which might be potentially removed for some ‘slip’ as the primary source of income for their household). Thanks for the info. It needs to be talked about (and there is a huge gulf between what went on today and what is being experienced throughout the country as with the 80s when many people experienced very hard times). Exactly. If you’re going to threaten people, you should at least be crystal clear about what you want them to do – anything else is psychological torture. Trouble is we comply. We complete the form. We obey the rulers. We should throw them out of office and I don’t mean replace them with Labour for more of the same. We need a Socialist government to nationalise essential services. Run by the people for the people. Yes revolution. That’s what the ruling elite feared in 1945 and they should fear it now. The ‘behaviour library’ test seems well dodgy. It is designed to look as if it comes from a legitimate source such as a university library, yet there is only ONE so called test on the entire site (the one quoted). In fact this test IS the entire site. Completing the test seems to generate some bizarre answers. For example Question 37: “I always say thank you, even for little things”. It’s also possible to click through the questionnaire WITHOUT ticking any boxes whatsoever – and still be ‘rewarded’ with a long list of guff about your supposed personal qualities. This report ends with advice to ‘discuss it with your Advisor’, so it seems to be a Jobcentre ‘front’. 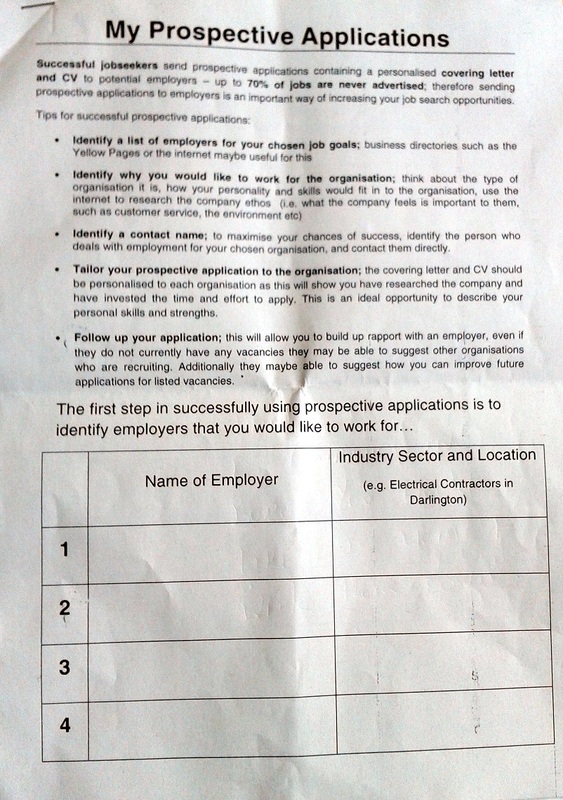 So the activity of completing this official looking “activity” is just another psychological scam on claimants – duping them into thinking they have undertaken a ‘scientific’ assessment, when at the end it delivers everyone the same bland pep talk, presumably intended for use by the Jobcentre to bully skilled workers into workfare shelf-stacking as their ‘proper’ vocation. And according to the majority of Tory MPs who have spoken about Maggie Thatcher, she has single handedly saved Britain. Obviously she has saved it only for those who were educated at a public school and don’t have to try and work their way through the benefit system with the incomprehensible forms and the threats of withdrawing their lifeline. Thank you Maggie, I never would have believed that your toxic legacy would last so long. If we can just cut through the propaganda for a moment to give the real facts about mining : Jobs were lost in numbers that dwarfed anything under Thatcher. 264 pits closed between 1957 and 1963. 346,000 miners left the industry between 1963 and 1968. In 1967 alone there were 12,900 forced redundancies. Under Harold Wilson one pit closed every week. 1969 was the last year when coal accounted for more than half of Britain’s energy consumption. By 1970, when the Conservatives were elected, there were just 300 pits left – a fall of two thirds in 25 years. By 1974 coal accounted for less than one third of energy consumption in Britain. Wilson’s incoming Labour government published a new Plan for Coal which predicted an increase in production from 110 million tonnes to 135 million tonnes a year by 1985. This was never achieved. Margaret Thatcher’s government inherited a coal industry which had seen productivity collapse by 6 percent in five years. Nevertheless, it made attempts to rescue it. In 1981 a subsidy of £50 million was given to industries which switched from cheap oil to expensive British coal. So decrepit had the industry become that taxpayers were paying people to buy British coal. Yes, I’ve heard that canard before. The pits in the 50s-60s closed at a time of economic growth and represented a much smaller percentage of the total than what Thatcher did, and the social impact was not even close. Reblogged this on Poplar Opinion. There is a connection between these two sentences. That’s because that sentence is a list of goals written by Maggie herself somewhere and copied and pasted into this letter to her. If you’re saying what I think you’re saying, you’re an idiot. I saw the original letter and it was absolutely a part of the original. No, I’m not at all saying what you think I’m saying. You think I’m saying Maggie cut-and-pasted those sentences into the letter. She didn’t. She set those goals with her case worker in a previous session, and he copied them into his letter to her to remind her that she set said goals. Not from what I’m told. It was handed to her unilaterally, and she was in a spin about the nature of the direction. This reminds me of a documentary that showed a psychiatrist assessing a man’s readiness to look after himself. The questions included “Why are you here?”, “What is your hypothesis?” and “Who irons your sheets?”. He was clearly bewildered and upset that his freedom seemed to depend on the answers. I have known many “Maggies” and am so glad she has a friend and advocate to help her with this nonsense. As a fellow writer, and highly literate, absurdly ‘qualified’ and ‘above-intelligent’ member of the public, who also struggles to find work, I can vouch for the incomprehensible communications sent out by the DWP concerning not just jobseeking, but mortgage relief, housing benefit, and other services. Without exception, every single letter I have ever received from them has been a) poorly spelt, b) astonishingly inept in their attempts at communicating information and c) deliberately intimidating to the reader. It’s almost as though the aim is to scare and frighten as many people as possible into just giving up their claims, as the prospect of wading through the incomprehensible paperwork and impossible requirements is simply too much to cope with. During a routine interview at my local Job Centre Plus, I informed my interviewer (whose handwriting included drawing little circles over her “I”s), that among the skills I possessed were proofreading, editing and copywriting, to which she replied “what’s that?”. It was at that point that I actually felt myself lose the will to live. It all sounds scarily familiar! A frightening insight into what really goes on in the dark corridors of power. As someone who has been on and off Jobseeker’s Allowance in the past few years, I can vouch for much of what this article says. I tried that test (it was on a link on another blog) and I put neutral in as the answer for EVERY question…surprise, surprise, it came up with a glowing report of my “strengths” which was obviously a load of old codswallop based on me answering neutral to EVERY question.